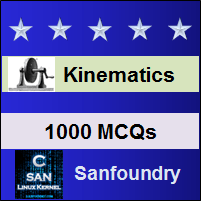 This set of Machine Kinematics Multiple Choice Questions & Answers (MCQs) focuses on “Properties of Instantaneous Centre”. 1. Which is the false statement about the properties of instantaneous centre? 1. A rigid link rotates instantaneously relative to another link at the instantaneous centre for the configuration of the mechanism considered. 2. The two rigid links have no linear velocity relative to each other at the instantaneous centre. At this point (i.e. instantaneous centre), the two rigid links have the same linear velocity relative to the third rigid link. In other words, the velocity of the instantaneous centre relative to any third rigid link will be same whether the instantaneous centre is regarded as a point on the first rigid link or on the second rigid link. N = n(n – 1)/2. Explanation: The Aronhold Kennedy’s theorem states that if three bodies move relatively to each other, they have three instantaneous centres and lie on a straight line. Explanation: A link is rotating about O. Velocity of point P on link w.r.t. point Q on link will be perpendicular to PQ. The velocity of any point in mechanism relative to any other point on the mechanism on velocity polygon is represented by the line joining the corresponding points. Explanation: The coriolis component of acceleration is always perpendicular to the link. Explanation: The angular acceleration of the link AB is obtained by dividing the tangential components of the acceleration of B with respect to A to the length of the link.